What a great several weeks we have had here at Earth Mantra; so many new artists have released so many tremendous albums recently that it really knocks our socks off. With this release, we don't exactly introduce someone new, since Jez Creek has released music on Earth Mantra before as part of the Combs Creek Haller collaboration. But it is the first time he has released a solo album with us, and we feel very honored indeed to release the marvelous new Modulator ESP album Event Horizon. This release is a single sixty minute long-player, improvised and recorded live on January 26, 2011 during the electro-music.com radio show "Adventures In Sound". But listening to the album, it is very difficult to tell this is a live recording. The music is so seamlessly composed and beautifully layered, it sounds as careful and deliberate as some of the best studio work we have heard. But recorded live it was, a testament to the astonishing talent that Jez brings to his unique and powerful electronic music. Hardware aficionados will appreciate the equipment Jez used for this performance: a Korg Wavestation fed a Frostwave Resonator filter, which then fed an FMR RNC compressor. The resulting signal was routed through an Electrix Repeater looper, and then through an Alesis Wedge effects unit. The filter was used to control the harmonics of the Wavestation sounds as they were played, and the looper feedback was set to around 70% so that as new layers were added old layers gradually died away. Whatever the rig used, the results speak for themselves. This is the kind of soft ambient music that floats and drifts effortlessly, a smooth-flowing stream journeying through a gorgeous and ever-changing landscape. The music is thoroughly tonal and yet somehow feels abstract enough to easily put the listener into a trance state. Certainly this music would serve as a perfect backdrop to any activity, but we also feel that hearing such a performance live would be an even more superlative experience, rewarding the active listener with an even deeper appreciation of the art involved. The fact that Jez composed this as he went along and yet created a work of such enduring value says a whole lot all by itself. Truly amazing work. 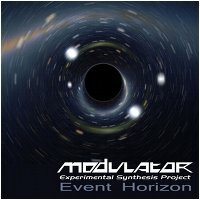 So it is with great pleasure that we introduce Event Horizon to our listeners and welcome Jez Creek / Modulator ESP as a new solo artist here on Earth Mantra. Certainly one of the notable releases of 2011 and one we highly recommend to all our listeners. Adventures In Sound is a weekly show on electro-music.com where alternate co-hosts Jez and Rob explore and experiment with journeys into ambient, electronic, and electro-acoustic sounds. For more information, please visit radio.electro-music.com. As much as this album takes its time at the start, I love how it develops as it ends! For the first half hour I listened to it in an unselfconscious fashion, but around the fiftieth minute the music sprung to life and surprised me with a powerful ending. Great album. Truly transcendental! Superb explorations and improvisations! Superb space ambience. I am always skeptical about such long tracks, because they most of the times tend to be boring and bleak, but this is just an example of a real good long drone that takes you through the magnificent journey in the deep space. Just put your headphones on and relax. So many great images appears in my head while listening to this album/track. Thanks Modulator ESP and EM. A neat voyage toward the Event Horizon. Hearing the music from here, it just continues endlessly as it approaches the black hole.Timeless.It activated some Klaus Schulze memory units in my brain, along the way. I confess: I was playing solitaire during the entire trip; won only one game, but so what. The music is great! Thank you, Jez.